If you missed Monday’s Horticulture Section seminar David, Goliath & Organic Seed Production in the Northeast, with Petra Page-Mann, Co-owner, Fruition Seeds, Naples, N.Y., it is available online. 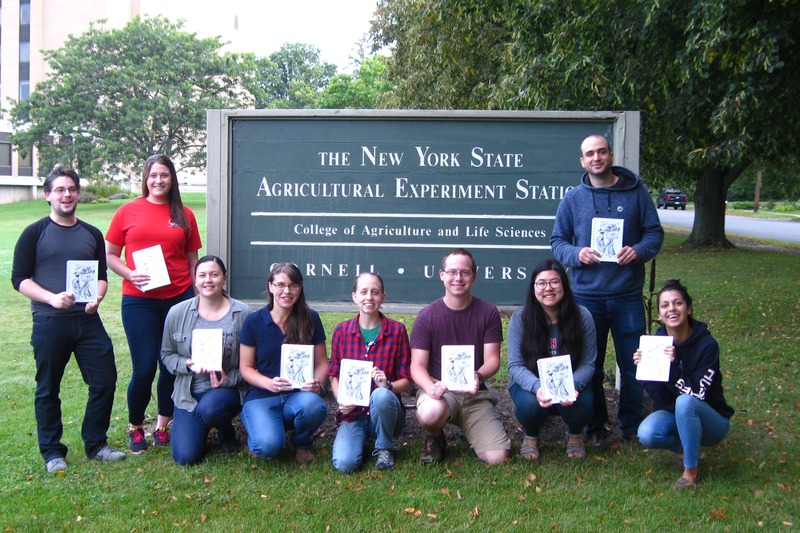 The Peck Lab will lead orchard tours at 1 p.m. and 3 p.m.
Come join the Cornell Orchards Store, Cornell Catering, and the Cornell Hard Cider Program Work Team for a family-friendly Finger Lakes Cider Week event celebrating all things apples and cider! 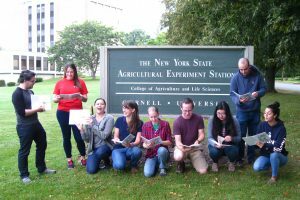 Cornell is a leader in hard cider research and outreach, and even teaches an undergraduate course on hard cider production! We will have a wide selection of specialized cider apple varieties available for tasting and participants can create their own cider blends using freshly pressed apple juice. 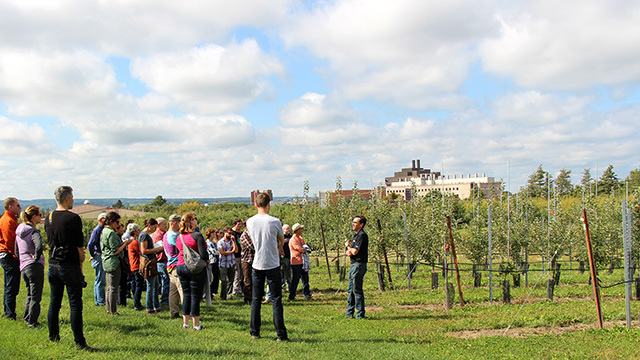 Starting at 1:00 p.m. and 3:00 p.m., the Peck Lab will lead walking tours of high-density cider apple research orchards. There will also be hard cider tastings from local producers along with delicious food pairings, and of course plenty of apples and sweet cider from Cornell’s research farms to purchase and take home. 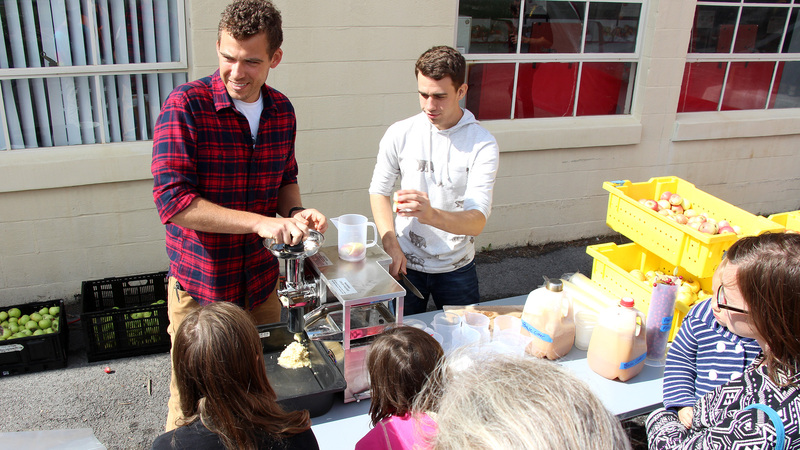 Come participate in a ‘make your own cider blend’ tasting activity. More than 70 Environmental and Sustainability Sciences (ESS) majors will take part in an ‘Art Intervention’ in Minns Garden (map) under the leadership of Philadelphia-based artist Marion Wilson, Friday, September 29 starting at 12:20 p.m.
“The students in the ESS colloquium (ESS 2000) will observe and draw the biodiversity of the garden from three perspectives: standing, kneeling and lying down,” says Johannes Lehmann, professor in the Soil and Crop Sciences Section of the School of Integrative Plant Science, who co-teaches the colloquium with Susan Riha, Charles L. Pack Professor in the Department of Earth and Atmospheric Sciences. “Then we’ll hang their works throughout the garden, together creating an ephemeral artists’ herbarium and installation of this small natural world on campus,” adds Lehmann. 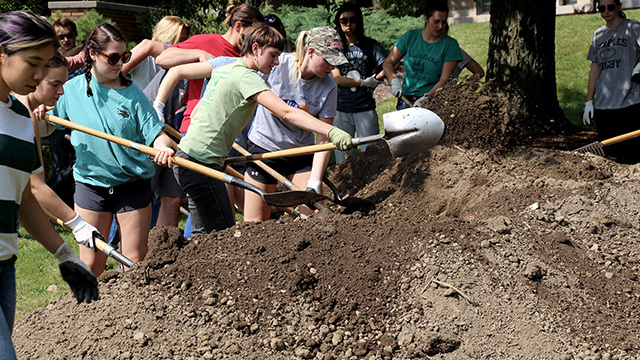 The Cornell community is invited to join in the process from 1:15 to 3 p.m.
Wilson is known for her frequent collaborative partnerships with students and botanists as well as, homeless people, real-estate developers, grocers, and government officials. In her own studio, she uses the lens of ecology to capture endangered landscapes and overlooked plant species, in particular moss. Craving some Black Magic Cake, Cherry Stuffed Tenderloin, or Red Lentil Coconut Curry? These are just some of the thirty nine recipes in the 2017 cookbook assembled by the Student Association of the Geneva Experiment Station (SAGES) to benefit the Geneva Bike Share Program. Recipes were contributed by faculty, staff, and students on the Geneva campus. SAGES President Adrienne Gorny draws particular attention to those derived from annual Chili Cook-offs, Cookie Bake-Offs, and Underappreciated Vegetable Cook-offs; this last being an event where Geneva campus employees are challenged to produce a dish incorporating a pre-determined underappreciated vegetable. Hannah Swegarden recommends her recipe for Tomato Basil Soup, perfect for this time of year when gardens are bursting with these two ingredients. 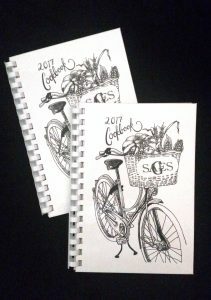 Available for $14 or two for $25, proceeds from the cookbook sales will be used to support the Bike Share Program at the Geneva campus. The SAGES Bike Share Program provides bicycles for rent to students and other members of the Geneva station community. Begun in 2014 with a few donated bicycles, the program has grown in the years since. Proceeds from cookbook sales will be used to expand the Bike Share Program by funding repairs of old bikes and purchasing of new ones. Donations can also be made directly to the program. 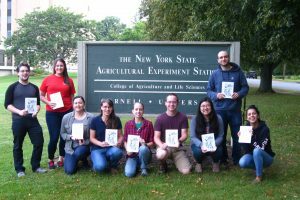 Cookbooks are available in the SIPS main office at 135 Plant Science in Ithaca or in Hannah Swegarden’s mailbox in Hedrick Hall, Geneva. Buy one soon and kick back with a piece of Larry Smart’s PhD Party Pie. Filled with chocolate, pecans, Kahlua, and Jack Daniels, it’s the cure for whatever ails you! 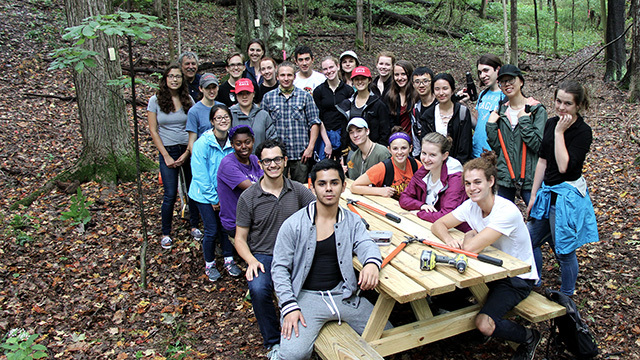 Taking advantage of a break in the rain showers Thursday afternoon, students in Collaboration, Leadership, and Career Skills in the Plant Sciences (PLSCI 1110) engaged in a service-learning project making improvements to the Habitat Trail outside of Trumansburg, N.Y. In addition to clearing paths of vegetation and downed trees, teams of Plant Sciences majors erected a trailhead sign, assembled a picnic table, affixed identification tags to trees, and soaked in the beauty of the flora and fauna on the site. The activity was organized by Leah Cook, Plant Sciences major coordinator, and Marvin Pritts, director of undergraduate studies, who teach the course. … and assembled a picnic table. 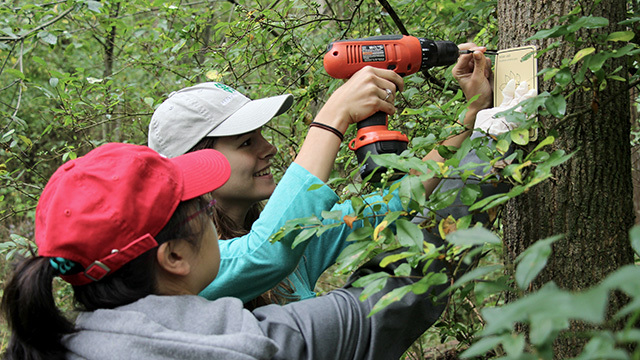 Biodiversity is not just a feature of the Amazon rainforest or other exotic locales. 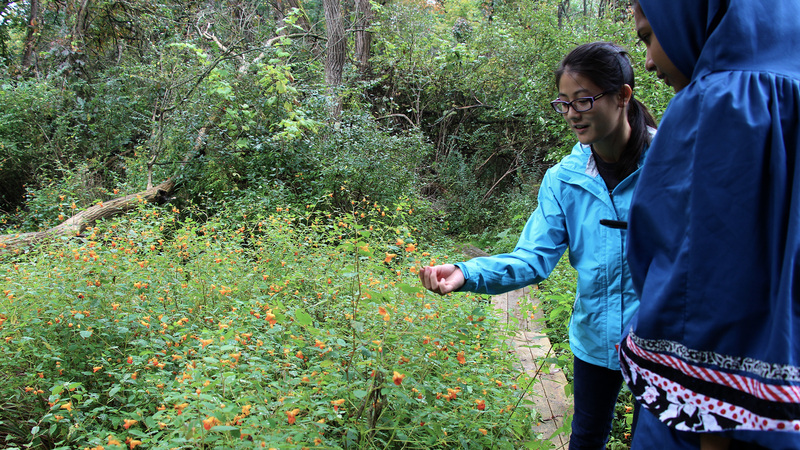 Hidden multitudes of species inhabit the Ithaca region, as participants in the inaugural School of Integrative Plant Science (SIPS) BioBlitz discovered Sept 8-9. A dozen teams tallied 1,250 species of higher organisms and more than 23,000 microbes during the 24-hour event to document as many species as possible. 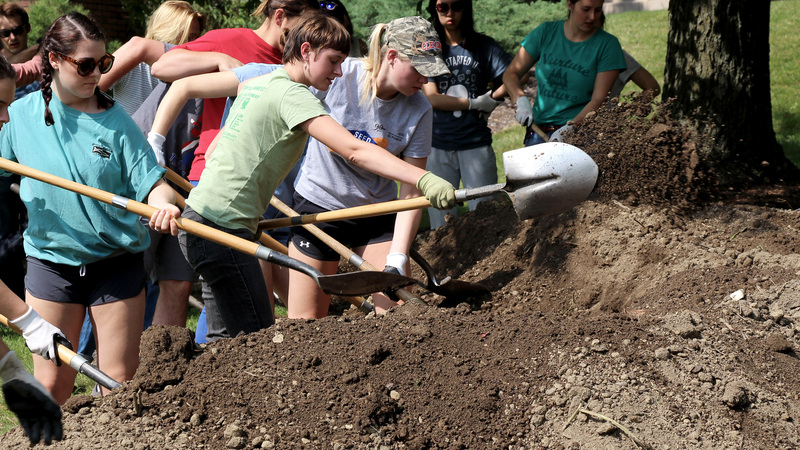 Held on the grounds of the Cayuga Nature Center (CNC) and Smith Woods, the event was the first in the region. The series started in 1996 in Washington, D.C., and has since spread around the world. 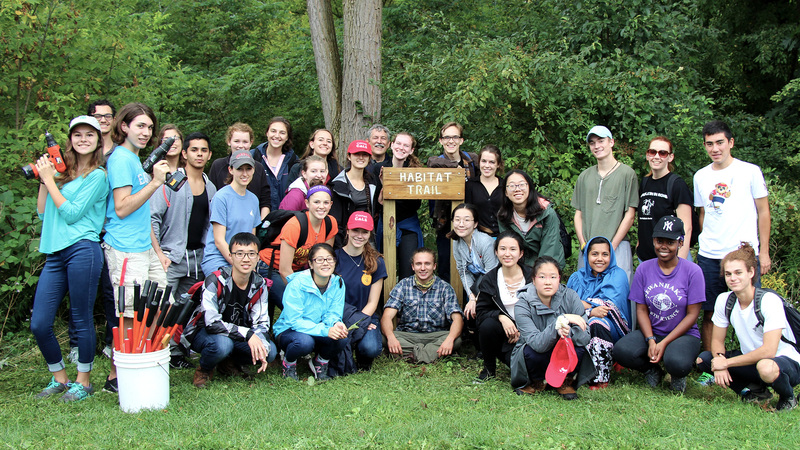 The 2017 SIPS BioBlitz opened Sept. 8 with remarks by Chief Samuel George of the Cayuga Nation Bear Clan; Warren Allmon, director of the Paleontological Research Institution; and Kathryn J. Boor ’80, the Ronald P. Lynch Dean of the College of Agriculture and Life Sciences. 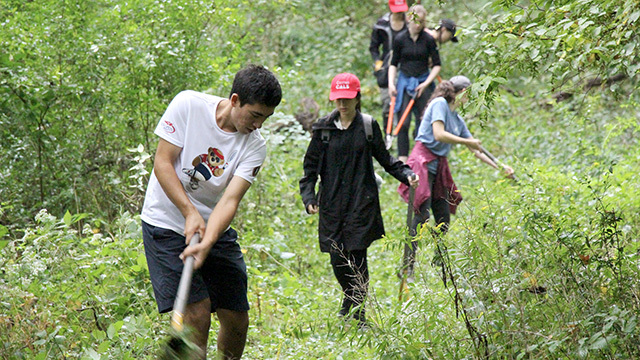 Boor and other speakers emphasized the importance of collaborations between universities and community members in preserving local lands and their biological diversity. 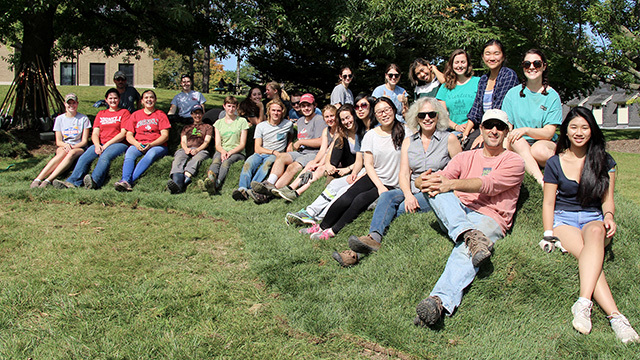 Taking advantage of the great weather this afternoon, students in the Art of Horticulture (HORT 2010) installed a crescent-shaped sod sofa in front of Fernow Hall on Tower Road. 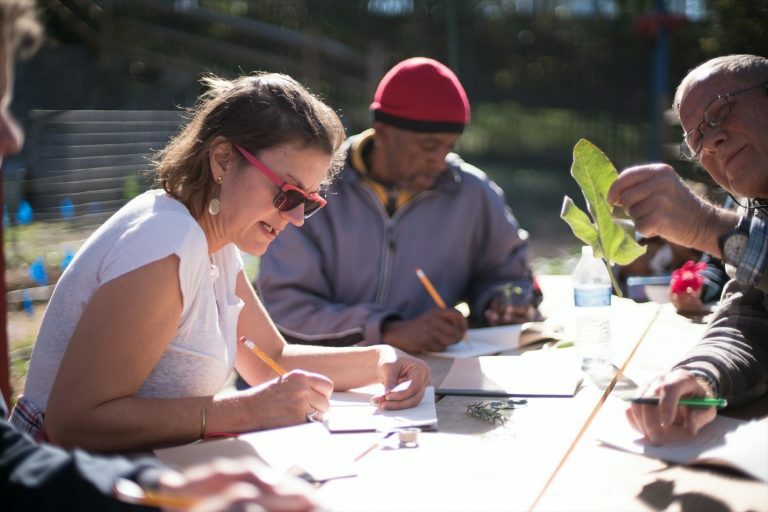 The experience is as much about building teamwork among the students as it is creating a living work of botanical art says Marcia Eames-Sheavly, Senior Extension Associate and Senior Lecturer in the Horticulture Section of the School of Integrative Plant Science, who teaches the course. “It’s got a great view of the sculpture in front of Fernow, alumni field and the hills beyond campus,” she says. Frank Rossi, associate professor and turf specialist in the Horticulture Section, provided additional coaching, and shared lively guidance that ranged from the science of working with turf, to how to lay sod. 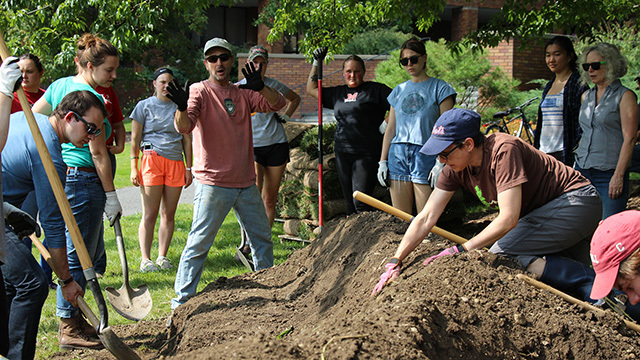 Cornell Grounds Department collaborated to have the materials on site, and supported the work in numerous ways. The sofa needs a few days to firm up and dry out. So best to test feel the sod with your hand before testing it out. 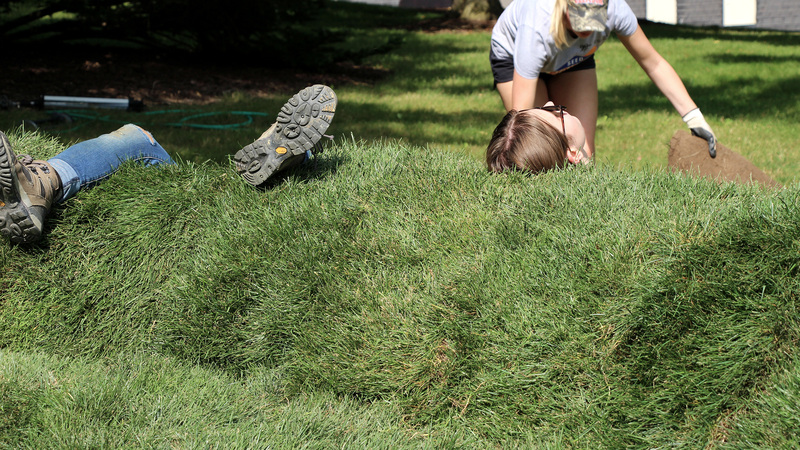 View pictures and video of previous sod sofa installations. Shaping the compost and topsoil that make up the base of the sofa. Frank Rossi, associate professor and turf specialist in the Horticulture Section coaches students in shaping the base. Art of Horticulture students install sod over the base. 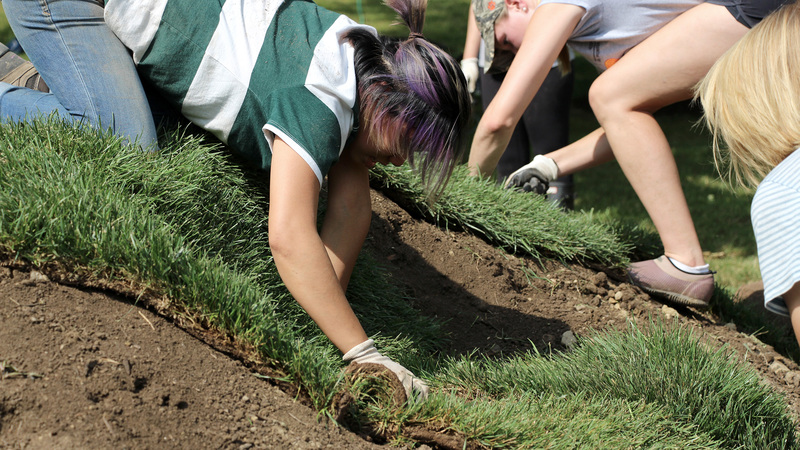 Testing comfort after sod installation. 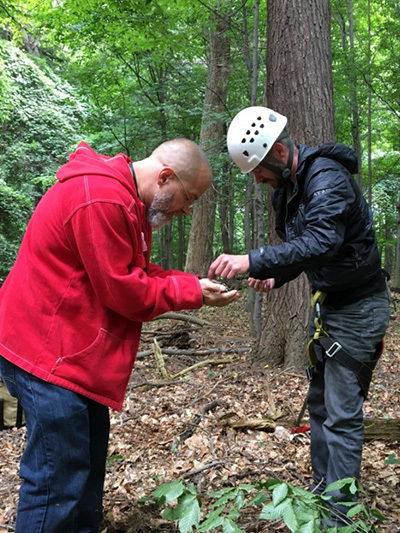 If you missed Monday’s Horticulture Section seminar Plant Exploration in a Changing World – Collecting in the 21st Century with Anthony Aiello, Director of Horticulture and Curator, Morris Arboretum, it is available online. Do you have a serious interest in developing a business plan for a New York state based commercial CEA vegetable operation? This conference is for you. 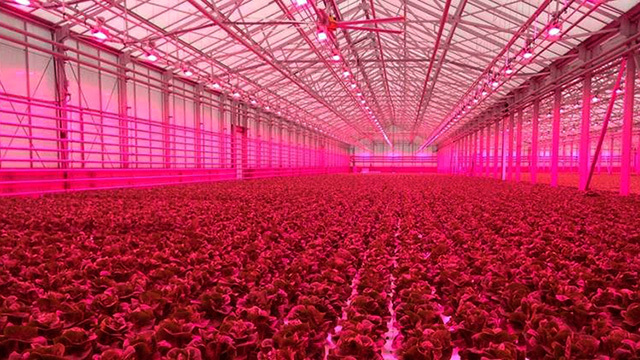 Controlled Environment Agriculture (CEA) enables year-round production of fresh vegetables through greenhouse environmental control (heating, lighting) combined with hydroponic/soilless production systems. While CEA is an increasingly popular method of meeting consumer demand for locally grown food, many factors must be considered when developing a business plan and assessing its viability. This conference is intended to provide more detailed knowledge of CEA production systems, economics, marketing, and ways to access financing and state resources. 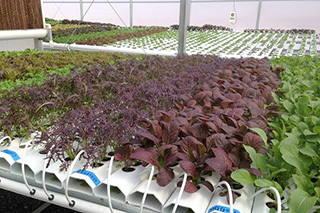 It will also help guide new or transitioning operations through the process of developing a business plan for a CEA greenhouse vegetable business. Read more about the conference and view the full agenda. Applications are due by September 29 and must be completed online here. If selected to attend you will be notified by October 3. Leading the tour at Chanticleer will be the garden’s public programs manager Erin McKeon, 2013 graduate of Cornell’s Public Garden Management Program. Feel the need to get off campus? The desire to surround yourselves with plants? 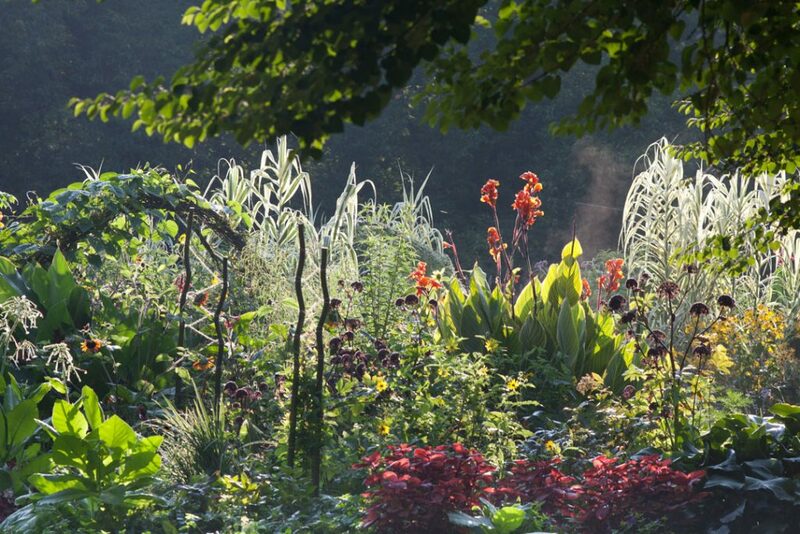 The urge to learn the workings of a meticulously cultivated botanical garden? This trip is open to all undergraduates, grad students, staff and faculty. For only $50/person, this is a very affordable package trip that includes bus transportation to/from Ithaca, breakfasts, guided tours, and admission to the gardens. Lunch and dinners are on-your-own, and hotel accommodations for two nights are available at a discounted rate. Important: You are responsible for booking your lodging, available for a special block rate, only if you make your hotel reservation by this Friday, 9/8. Download trip details and registration form. Questions? Contact Dr. Mark Bridgen, Advisor to Pi Alpha Xi, at mpb27@cornell.edu or 631-921-4941.